Islamic State’s black flag, which is also used by several other jihadist groups such as the Taliban, Al Qaeda, Al Qaeda’s Al Nusra Front, the Chechen jihadist fighters and non-violent Islamist groups such as Hizb ut-Tahrir, is never mentioned in the Quran. Although the black flag appears in the Hadith (reports of the teachings, deeds and sayings of the Prophet), it is based on weak symbolism or the narrations are unsubstantiated. Lately, images of black flags have become a prominent feature in the media. It is proudly displayed by militants of the Islamic State (IS), formerly known as the Islamic State in Iraq and al-Sham (ISIS)/Islamic State of Iraq and the Levant (ISIL), during their victory parades and are flown across vast Sunni territories in Iraq that have fallen into their hands. In fact, the black flag is not exclusively used by the IS. It is used for its symbolic value by a number of radical and militant groups such the Taliban in Afghanistan, Jabhah Al Nusrah/ Al Nusra Front (a branch of Al Qaeda) in Syria, Al Qaeda central in Afghanistan/ Federally Administered Tribal Areas (FATA), the Chechen jihadist fighters and the Hizb ut-Tahrir (‘Party of Liberation’, an unarmed international Islamic political movement headquartered in Lebanon), as depicted in the accompanying table. By and large, the general public is not aware of the symbolic meaning behind the said flag. More perceptive individuals would speculate that the flag’s black colour may not be a coincidence, and that it may hold some significance that they are left only to ponder upon. Thus, this article is written to provide a brief explanation of the symbolic meaning behind the black flag used by Islamist groups, as well as to discuss the validity of this meaning from the Islamic theological viewpoint. The use of the black flag by Muslim revolutionary movements is not new. Prophet Muhammad used the black flag as his military flag. However, the Prophet’s black flag was never a ‘symbol’ of his movement; it was used merely for the purpose of identification, to differentiate between his army and the enemy’s. It has also been reported that the Prophet used other colours in his military flag. The black flag was prominently used by the Abbasid (‘Islamic’) revolutionary movement which was based in Khurasan (what is today the region covered by Afghanistan, Central Asia, Iran and parts of Pakistan). This movement rebelled against the Umayyad caliphate, reportedly as the Abbasid felt that they had the utmost right to lead the caliphate state due to their direct family connection with the Prophet, while the Umayyad were from the Quraish tribe. The Abbasid movement was successful in bringing down the Umayyad caliphate to found the Abbasid caliphate in Baghdad in 750 C.E. The black flag then became the official flag for the Abbasid. Thus, many historians argue that the Abbasid revolution is the major contributor to the contemporary popularity of the narrative of and mystical meanings surrounding the black flag. It should be noted that even during the time of the Abbasid revolution, fabricated stories and narratives were disseminated until they became part of accepted popular tradition and legend in the name of Islam for the purpose of winning over the people’s support for the revolution. The black flag is nowhere mentioned in the Quran. There is not even a single intimation in the Quran that promotes the use of the black flag or regards it as holy or sacred. What then makes the black flag a positive symbol to be capitalised by contemporary radical movements? The answer is in a few Hadith (reports of the teachings, deeds and sayings of the Prophet), recorded in Books of Hadith (‘Prophet’s Tradition’), Islam’s second most authoritative source. The Hadith prophesise the emergence of an army from an area known as Khurasan (the region constituting Afghanistan, Central Asia, Iran and parts of Pakistan today) flying the black flag before the end of this world. From this army, the Muslim Mahdi (‘Messiah’) will arise and lead it to achieve decisive victory against enemies of Islam, to finally restore the glory of Islam. The Hadith also call on Muslims to support and join the army of the black flag when it appears. However, the Hadith do not provide details of the actual design of the black banner, and consequently jihadist groups carry different versions of the black flag. 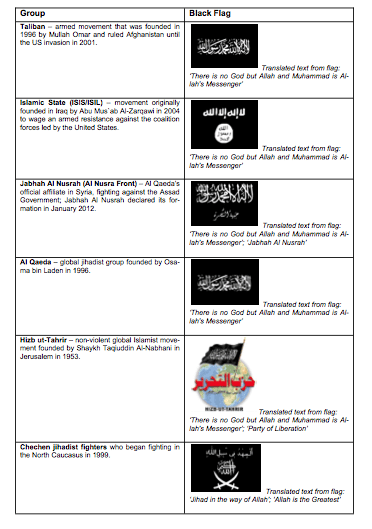 Different Islamic (Arabic) expressions such as ‘La ilahailla Allah Muhammad Rasul Allah (‘There is no God but Allah and Muhammad is Allah’s Messenger’), ‘Allahu Akbar’ (‘Allah is the Greatest’), Al-Jihad Sabiluna (‘Jihad is our way’) and others have been included by contemporary groups to enhance the flag’s allegorical power. Since the theological basis of the black flag is derived from the Hadith, it would be appropriate to analyse the authenticity of the relevant Hadith in order to ascertain their validity in Islam. This article will not be able to discuss all of the many Hadith pertaining to the black flag, but will analyse a selected few, key Hadith in relation to the meaning given to the black flag in line with the approach used in Hadith Studies. The analysis will conclude with the general theological position held by Muslim scholars on Hadith relating to the black flag. Abdullah bin Mas`ud narrated that the Prophet said: “A Nation will come from the east with a black flag and they will ask for some charity [‘khair’] (because of them being needy) but the people will not give it [charity] to them. Then, they will fight and win over those people (who did not give them what they asked). Now the people will give them what they asked for, but they [the army] will not accept it until they [the people] will hand it [charity] over to a person from my progeny who will fill the world with justice just as it was previously filled with oppression and tyranny. So if anyone of you finds this nation (from the east with black flags) then you must join them even if you have to crawl over ice. This Hadith is narrated by Sunan Ibn Majah and Musnad Al-Bazzar from Yazid ibn Abi Ziyad, from Ibrahim Al-Nakha`i, from Abdullah bin Mas`ud to the Prophet. However, Al-Bazzar (827- 904C.E), a scholar of the Hadith and author of Al Musnad (‘A Collection of Authoritative Narrations’) has said that Yazid ibn Abi Ziyad (the narrator of the above Hadith) was not known to receive the Hadith from Ibrahim Al-Nakha`i. Waki `ibn al- Jarrah (746-812 C.E. ), and a Hadith scholar born in Iraq has said, “This Hadith is not known.” Ahmad Bin Hanbal (780-855 C.E. ), founder of the Hanbali School of Jurisprudence, held the same view. Hammad bin Usamah, a narrator of the Hadith, as reported in Al-Dhu`afa (‘A Collection of Weak Narrators’) by Al-`Uqaily, declared that he will never accept Hadith from Yazid ibn Abi Ziyad, even if he swore (upon its truth) fifty times in front of him. Al-Zahabi said in his book Siyar Al- A`alam (‘Scholars’ Biographies’) that Yazid is a Hadith narrator with a flaw, and Ibn Hajar in his book Taqrib Al-Tahzib (‘Simplified Refinement of Biographies’), regarded him as a weak Hadith narrator (with a Shi’ite inclination). This Hadith was narrated from Abdul Rahman Al- Jarshi whose real identity is unknown. The text cannot be traced to any sources, which thus makes it unverifiable. (Armies carrying) the black flag will come from Khurasan. No power will be able to stop them and they will finally reach Eela (Aqsa Mosque in in Jerusalem) where they will erect their flags. This Hadith is narrated by Ahmad bin Hanbal, Al- Tirmizi, Al-Tabarani and Al-Baihaqi from Rusydain bin Sa`ad,Yunus bin Yazid, Ibn Syihab, Qubaishoh bin Zuaib, to Abu Hurairah. Al-Tirmizi, author of Sunan Al-Tirmizi (‘Collection of Hadith by Al-Tirmizi’), ruled this narration as weak because the actual chain of narrators is doubtful: some narrated from Yunus – from Ibn Shihab, while others narrated from Rusydain – from Ibn Shihab. When you see the black flag coming from Khurasan, join them even if you have to crawl over the snow … that is the army that will liberate the Holy Land, and there is no power that can stop them. Hadith scholars such as Al-Zahabi, Ahmad bin Hanbal and Al-Tabarani have concluded that this Hadith cannot be accepted because the content has been intermixed with other narrations on the black flag of Khurasan. If you see the black flag coming from Khurasan, go to them immediately, even if you have to crawl over the snow, because indeed amongst them is the Caliph al-Mahdi …and no one can stop the army until they get to Jerusalem. This Hadith was also narrated by Imam Ahmad from the path of Sharik bin Abdillah – from Ali bin Zaid bin Jad`an – from Abu Qilabah – from Thauban. According to Al-`Ijli, in his book Ma’rifatAl-Rijal (‘Biographies of Narrators’), the chain of this Hadith is disconnected because Abu Qilabah never heard a narration from Thauban. Ibn Al-Jauzy, in his book Al-‘Ilal Al-Mutanahiah (‘Microflaws of Narrators’), stated the same path for this Hadith and concluded that Ali bin Zaid bin Jad`an is a narrator with a flaw. This Hadith was also narrated by Ibn Majah and Al-Bazzar from Abd Al-Razzaq Al-San`ani – from Al-Thauri – from Khalid Al-Hazza’ – from Abu Qilabah – from Abu Asma’Al-Rahbi – from Thauban. Scholars, however, differ on the validity of the Hadith from this path. Al-Bazzar and Al-Hakim considered it as authentic. Ibn `Ulayyah, Al-`Uqaili and Ibn Qudamah ruled it as “weak and similar to the chain of Khalid Al- Hazza”, as reported in the books Al-`Ilal (‘The Flaws’) by Imam Ahmad and Al-Dhu`afa (‘The Weak Narrators’) and Al-Muntakhab Min `Ilal Al- Khallal (‘Selections of Flaws from al-Khallal) written by Ibn Qudamah al-Maqdasi. The black flag will come out for the children of Al- Abbas. The other black flag will come from Khurasan. Their turbans will be black and their clothes white. On their front will be a man named Shuayb, the son of Salih, from Tamim. They will defeat the companions of the Sufyani until he comes to the House of Jerusalem where he will establish his power for the Mahdi, and he will be supplied with three hundred (men) from Syria after his arrival and the matter will be settled for the Mahdi in seventy-two months (six years). Contemporary scholars such as Sheikh Abdul Aziz Al-Turaifi, Sheikh Adnan Al-`Ar`ur, Sheikh Abdullah Al-Mutlaq and many others rule that this narration cannot be traced to any source. There is a possibility also that the content has been mixed with other narrations associated with the black flag and Al-Mahdi (‘Messiah’). Several conclusions can be made based on what has been presented above. First, the black flag has no clear figurative meaning in Islam due to the absence of strong evidence to support it, as the authenticity of the narrations are considered weak or are rejected by scholars of the Hadith. The key basis for their rejection is a ‘flaw’ in a narrator or due to a narration being fabricated. Ahmad bin Hanbal (founder of the Hanbali School of Jurisprudence) prohibits all narrations on the black flag because they are not reliable or authentic. Sheikh Al-Sharif Hatim bin Arif Al- `Auni, an expert in the field of Hadith Studies from Umm Al-Qura University has said, “Symbols such as the black flag has been fabricated by liars for their own personal agenda from the past till today.” His view is consistent with that of Al-Zahabi, author of Al-Siyar and Al-Tarikh Al-Kabir, who said that history has recorded how Abu Muslim al-Khurasani (718 – 749 C.E. ), an Abbasid reformist who became the governor of Khurasan, was the one who raised the black flag during the rise of the Abbasid Caliphate and similarly, Yazid bin Mahlab, a rebel at the time of Umar bin Abdul Aziz, raised black flags calling upon the people to give him a pledge of obedience. Second, in addition to the above reasoning that the said narrations are not acceptable, it can be concluded that no one should believe, support or join any group that makes use of the black flag to legitimise their struggle simply on the basis of the symbol. Muslims should not regard them as the trustworthy group representing Truth simply because they carry the black flag. A third conclusion to be made is that history itself has provided proof of the invalidity of the black flag claim: Al-Mahdi did not appear and the Day of Resurrection did not come about after the black flag was raised by the Abbasid rebellion or the various groups that came later. Even if, for the sake of argument, the narrations are considered acceptable based on a few ‘authentic’ Hadith or the narrations mutually strengthen each other, no one can give assurance that a group that raises the black flag represents the group prophesised by the Prophet. It is possible that the Prophet refers to a group which has not emerged yet. The use of the black flag or banner by jihadist groups such as IS has been an act of manipulation of popular folklore among Muslims to support their political agenda. However, contemporary militant groups have understood very well the weaknesses of the black flag Hadith within Islamic theology, and that the religious meaning of the black flag is just a myth. Thus, they have never used these Hadith as a basis for or a part of their ideology. A search on the Minbar Al-Tawhid and Al-Jihad website, which is considered to be the largest repository of jihadist ideological materials, does not produce any results on black flag Hadith or related materials used by militant groups. It is important for Muslims to understand that Truth is not defined or represented by symbols such as a flag, turban, colour or clothing style. Truth in Islam is based primarily on evidence found in the Quran and Hadith which can be supported by reasoned arguments. It must also be manifested through right behaviour according to the religion. Thus, no symbol or slogan, can justify acts of terror and extremism. Mustazah Bahari is an Associate Research Fellow and Muhammad Haniff Hassan (PhD) is a Research Fellow with the International Centre for Political Violence and Terrorism Research at the S. Rajaratnam School of International Studies (RSIS), NTU. Muhammad Haniff Hassan is a Fellow at the S. Rajaratnam School of International Studies (RSIS) and holds a Ph.D. in Strategic Studies from RSIS (formerly known as the Institute of Defence and Strategic Studies), Nanyang Technological University (NTU). He received his early education at Aljunied Islamic School. He then pursued higher education at the Faculty of Islamic Studies, Universiti Kebangsaan Malaysia, and graduated with honours in Syar’iah and Civil Law.